A while back in the comments for the Tuna Salad Sushi, Tanit suggested using Siracha hot sauce in the Tuna Salad sushi. We finally got around to trying it, and although I’m not so fond of it (I’m not a big fan of spicy things, although I am beginning to be able to tolerate wasabi 😉 ), Son loved it! If you like spicy like Son likes spicy, definitely try it! Today Son and I went and played tennis. 🙂 Now this might not seem like a big deal, but I haven’t really played since I took lessons when I was 8 or 9, while Son was on the tennis team both at his high school and at his undergraduate college!!! So of course, we were very unbalanced, with really bad me on one side, and really good him on the other. Thankfully he was really nice about it today (unlike other times, when he has accidentally kicked soccer balls into my stomach or hit me with a power serve in tennis!) and was helping me improve my technique so that I could hit the ball straight and make it in the court (rather than hitting it on an angle such that it goes flying high). He even taught me to do a proper (overhead) serve!! I have never been able to do those, and I was able to hit the ball today, although it never actually made it over the net when I did an overhead serve. Yes, I was really bad, and really weak. 😛 My arms hurt. Mix the tuna with mayonnaise and Siracha sauce. Roll the sushi. 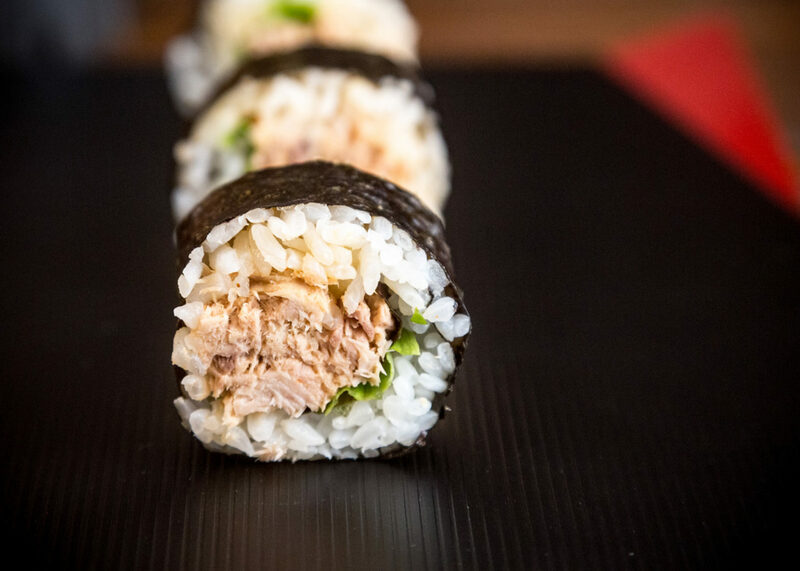 For your fillings, place a couple of lettuce leaves on the sumeshi-covered nori and place about half a can of tuna salad on the lettuce, then roll the sushi as you normally would. Looks easy and tasty! (And I DO like it hot) I have not attempted much sushi lately but I think it may be about time to try again. Thanks for the idea! This does look delicious. I wonder how (hot) spicy is it with the amount of Siracha hot sauce you specify in this recipe. Amy – 🙂 I hope you like this! YUM! This looks like the fishy version of the recipe that’s on the Post Punk Kitchen web site… not that that’s a bad thing at all! I just found your site today and have thoroughly enjoyed looking through your recipes. This one in particular made me laugh though because I’ve been making this (minus the lettuce) for about 8 or 9 years. When I told my friends about it in the beginning they started calling it “White Trash Spicy Tuna” and the name just stuck. It’s perfect because I ALWAYS have the ingredients on hand and don’t have to worry about having fresh fish when I get a craving for sushi. I’ll definitely keep coming back to your site now that I’ve found it…and I’m telling my friends! I loved the idea of this roll but I wanted a more complex flavour so I cut the chili paste to 1 Tbsp. and added 2 tsp. chili oil, 1/4 tsp. powdered ginger (you could use fresh, but I recommend powdered if you don’t want the ginger to overwhelm the other flavors), a 1/2 tsp. sesame oil and 4 or 5 scallions (mixed in). This was so delicious and spicy . oops, nearly forgot the 1/4 of a tsp. garlic powder. It may sound a little weird, but all the flavors blend together and nothing stands out too much. Oh and I also forgot to thank you for your fabulous website. It really makes me realize just how uninspired my rolls have been lately. Thanks for the inspiration; I’ll check back frequently.